It’s been a good month for Moamer Gaddafi who just completed his tour of Europe with his 40 virgin body guards, a camel and a heated tent. Libya will take over the presidency of the UN Security Council this month. Libya has taken over the rotating presidency of the UN Security Council in a major step back to global respectability after decades of being treated as a pariah by the West. 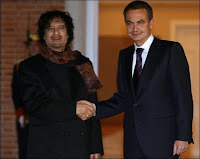 The North African country was elected in October, as were Burkina Faso, Costa Rica, Croatia and Vietnam, to sit on the council during 2008-09 after the United States, which foiled two earlier bids by Libya, decided not to block it this time. By an alphabetical accident, Libya becomes president of the 15-nation body from its very first day as a member, succeeding Italy. Each country is president for a month, the rotation going in English alphabetical order of names. Libya and Burkina Faso had been unopposed after being endorsed by the African regional grouping for two African seats that fell vacant on December 31. The Security Council is the powerhouse of the United Nations, with the ability to send peacekeeping troops around the world and impose sanctions on specific countries. EYE on the UN is also reporting this news.